Preheat the oven to 180°C. Season the chicken breasts with salt and ground black pepper. Lightly dust the chicken with flour and shake off the excess flour. Heat the butter and the oil together and fry the chicken breasts until golden on both sides. Remove from the pan and place in a baking dish. Fry the spring onions in the pan until soft. Add the garlic and fry for 1 minute. 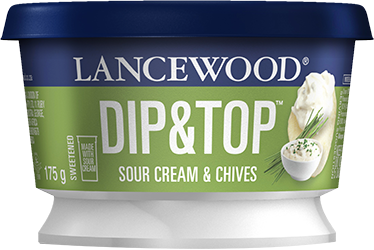 Add the LANCEWOOD® Dip & Top Sour Cream & Chives and milk. Heat through. Pour the sauce over the chicken breasts. Sprinkle the topping over. Bake for 30 minutes until golden and bubbly. Remove from the oven and sprinkle with chopped chives. Serve with a fresh green side salad and rice or pasta. Use leeks instead of spring onions. Add a tablespoon of wholegrain mustard. 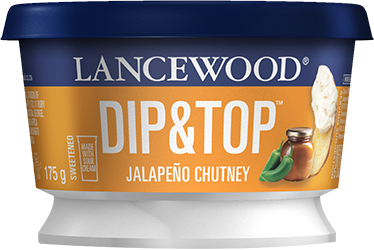 Spice up your chicken breasts and use LANCEWOOD® Dip & Top Jalapeño & Chutney or LANCEWOOD® Dip & Top Roasted Thai Peppers instead of LANCEWOOD® Dip & Top Sour Cream & Chives. Finish with chopped coriander.